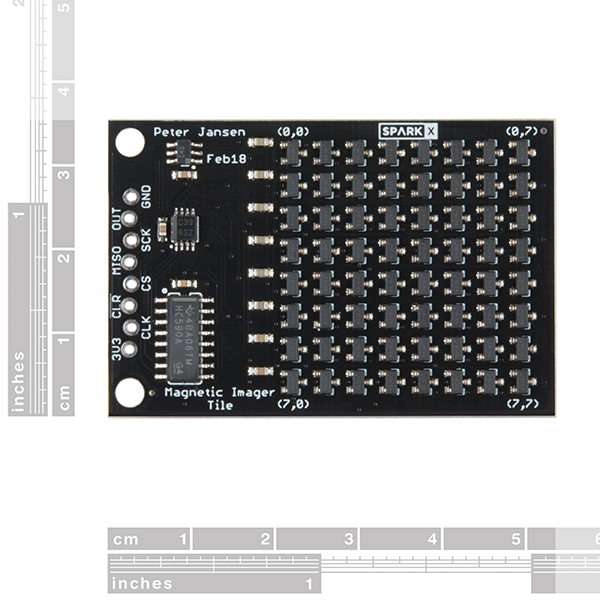 The Magnetic Imaging Tile uses an array of 64 hall effect sensors to convert magnetic fields to the visual spectrum. That's right! You can now see magnetic fields in real time! 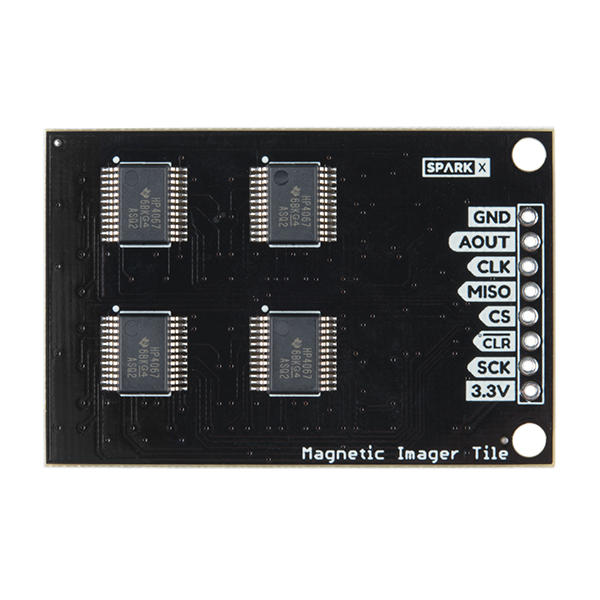 As is to be expected, there are caveats: the magnetic sensors used on the tile are some of the most sensitive on the market but you need to be within 1 to 2 centimeters of the tile to get a good image. The demo shown in the animated gifs don't quite give the Magnetic Imaging Tile justice! The frame rate of gifs is too low! Please see Peter's demo video for some amazing visuals. For our demo in the gif we used a SAMD21 Mini to clock out the ADC data to the serial port at 115200. The serial is then parsed by a Processing sketch. All software is open source and available in the repo. This setup can achieve over 76 frames per second. With buffering the setup is capable of 200 fps. The ChipKit MAX32 is also supported and can achieve around 2,000fps. A faster processor should be able to achieve 1500fps (the 100kSPS limit of the ADC). The raw analog signal is also exposed. This allows processors that have built-in faster ADC to convert the signal directly. The theoretical limit of the DRV5053 is around 20,000 fps but would require a very fast ADC. 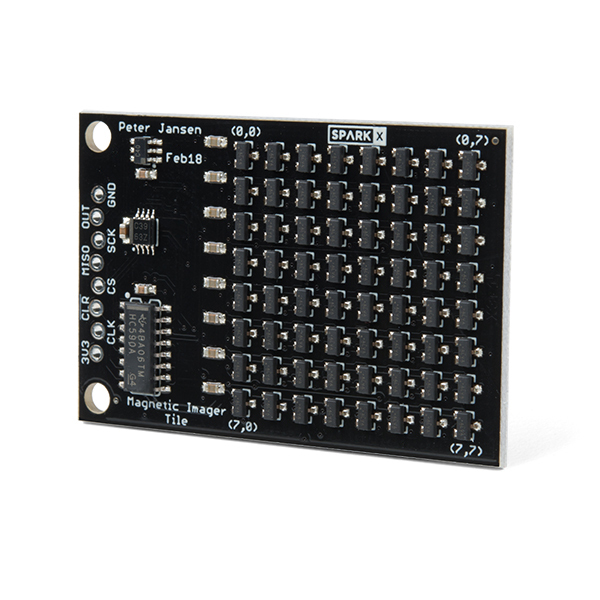 This is a collaboration with Peter Jansen of the "Open Source Science Tricorder Project. You can read about his work on the project on Hack A Day. Note: The board label (they look great, don't they?) for 3V3 is correct. 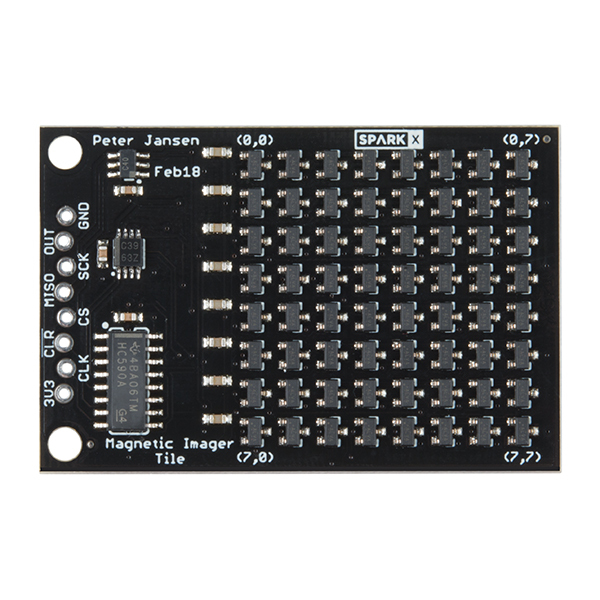 But you can also safely power the board with 5V. This will increase the overall resolution of the ADC and improve the performance. Boards can be tiled next to each other to increase field size with a one 'pixel' gap between boards.